The altE Store is excited to add Lithium Ferro Phosphate (LFP) Smart-Tech batteries from SimpliPhi Power to our deep cycle battery offerings. We now have a full range of 12V, 24V, and 48V lithium batteries for your solar system. SimliPhi’s lithium battery capacity options range from 655Wh (watt hour) to 3.4kWh, depending on the model, and can be paralleled to increase your storage to as large as you need. SimpliPhi batteries are made in the USA. They have a 10 year, or 10,000 cycle warranty. The batteries are capable of handling heavy loads, up to a C/2 charge and C/1 discharge. C/2 means the current coming from the charging source (charge controller) is half the amp hour rating. For example, the 51.2Ah batteries can support a charge up to 25A, and can handle a load up to 60A! This would drain the battery to 100% Depth of Discharge (DoD) in one hour, and could be recharged to 100% State of Charge (SoC) in 2 hours. Don’t try that with most deep cycle batteries. You’d turn a perfectly good lead acid battery into a boat anchor in no time at all. Not a problem for the SimpliPhi batteries. How’s it compare to good ol’ lead acid batteries? While the SimpliPhi lithium batteries are more expensive when comparing directly Wh to Wh with lead acid batteries, if you compare the cost per cycle over the life of the battery, you’ll see the system cost for the lithium batteries can be less than lead acid. In fact, they can save you money versus competing batteries. How can that be, you may ask? Let’s compare a classic in the off-grid solar world, the Trojan T-105 flooded lead acid battery. It’s 6V, 225Ah (amp hour) for a total of 1350Wh (watt hour). It costs about $160. We’ll compare that with the SimpliPhi 1310Wh 12V, 102.4Ah, that costs about $1750. I know, that’s 10x more for almost the same capacity battery, but stick with me for a minute. A typical lead acid battery does not like to be deeply cycled, charged and discharged. The 50% depth of discharge (DoD) we commonly hear about is a last resort, after 3 or 4 days of no sun. You do not want to discharge the battery that deeply daily. If you do, the battery may only last a few years. As you can see in the graph below, using 50% of the Trojan T-105 battery, a workhorse of off-grid solar systems, each day would result in about 1200 cycles. But if you only use 20% of the battery each day, you can more than double its life to 3000 cycles. 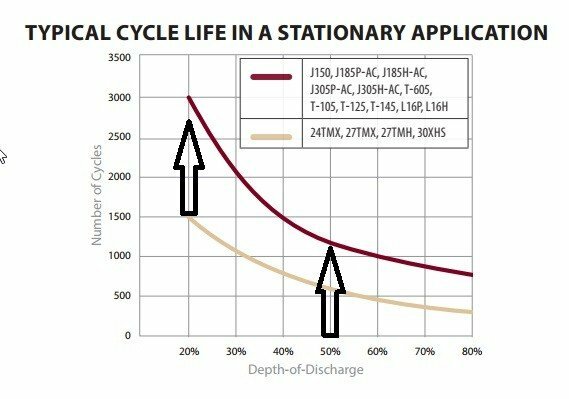 Let’s use 20% daily Depth-of-Discharge (DoD) as an example for the lead acid batteries. Using 20% of a 1350Wh battery gives us 270Wh of usable energy. Using 80% DoD for the SimpliPhi 1310Wh lithium battery gives us 1048Wh of usable energy. So we would need 4 of the T-105 batteries to equal the usable capacity of the SimpliPhi battery. $160 x 4 = $640. OK, so we are still not equal with the lithium battery price. Hang in there. This is where cycle count comes into play. At 20% DoD, the lead acid batteries are rated for 3000 cycles. At 80% DoD, the SimpliPhi lithium batteries are rated for 10,000 cycles. That means, you will have to replace the lead acid batteries more than 3 times to get the same life cycle of the SimpliPhi batteries. So $640 replaced 3 times equals $1920 for 9,000 cycles, compared to $1750 for 10,000 cycles of the SimpliPhi. Hey! You are saving money with the SimpliPhi lithium battery bank. Add to this the fact that the SimpliPhi batteries are maintenance free, so no more checking the water and specific gravity (SG) of your batteries. So they save both time and money. Now lets compare size and weight. The T-105 is 10.375″ x 7.125″ x 10.875″ (0.46 cubic ft) and weighs 62 pounds. The SimpliPhi 1310 is 11.25″ x 9.25″ x 6.25″ (0.37 cu ft) and weighs 32 lbs. So they are similarly sized, but the SimpliPhi lithium battery is half the weight (lead is heavy). But we need four of the T-105s to equal the usable energy of the SimpliPhi, so that will total 1.84cu ft for the T-105 battery bank, and will weigh a whopping 248 lbs vs. 32 lbs for the SimpliPhi. My chiropractor and shipping manager vote for the SimpliPhi option. There are several different lithium chemistries used for batteries. Many of the batteries you have been hearing about in the news are lithium cobalt oxide or LCO. LCOi-ion batteries are used in cell phones, laptops, hoverboards, Boeing 787 Dreamliners, and Teslas, to name a few. Lithium cobalt batteries have a risk of fire due to a short across the cell or thermal runaway, and in larger systems they often need to be actively cooled by fans. SimpliPhi Power batteries use lithium ferrous phosphate (LFP) with very different results. SimpliPhi’s LFP batteries do not have the thermal runaway fire risks. They are completely safe, even if you drive a nail through it. There is also no risk of thermal runaway, eliminating any need for special cooling. You can read more details about the safety of SimpliPhi batteries here. LFP batteries also don’t out-gas, so no ventilation is required, so you can put them in an un-used crawl space and have no worries. This flexibility is something you don’t have with standard deep cycle flooded lead acid batteries. 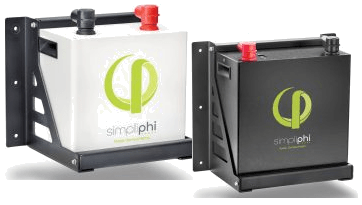 The SimpliPhi batteries are non-toxic, non-hazardous, and recyclable. An 80A breaker is integrated into each battery, providing both over current protection and a convenient on/off switch. Multiply that by days without sunshine (days of autonomy) to get your total usable capacity needed. Then divide that by 0.8 for 80% depth of discharge, and you have your SimpliPhi batttery bank size. For example, if you need 2500Wh a day for 3 days, and have an inverter with 93% efficiency, the math becomes 2500Wh X 3 days / 0.93 efficiency / 0.8 DoD = 10,080Wh battery bank. If you have a 24V system, you could use three of the 3440Wh 24V SimpliPhi Smart-Tech batteries in parallel for 10,320Wh capacity. You can check out our new video interviews with SimpliPhi as we discuss their company overview and their lithium batteries. Fill out our off-grid solar, grid-tie or solar water pumping questionnaires if you would like help designing your entire solar system. I think way too small. This was also not good so added another 100 AH cell. 16s 2p. Now happy with it. or for me that’s 50 amps min. Then they do not need “cell balancing” as much. And I don’t need to worry about going below 3 volts per cell as the forklift battery’s help and hold at 48.8 volts for long time. They can be charged pretty heavily, almost a C/2 rate. For example, the PHI2.6-24V is a 102.4Ah battery, and its max charge current is 45A, and its max output amperage is 60A. Thank you, I appreciate the info. The future is coming fast, I’m building a Power plant and there still using 2 volt lead acid batteries for back up, really got to hand to this folks. LoL Thanks for all you do. Still questioning the settings on the Magnum MS4024 PAE inverter settings for charging the new LFP batteries, holding off till I know that the state of charge on these battery(s) can be monitored and identified by the Charge controller correctly , to prevent over charge or when its time to charge, if the voltage output remains constant, how will the controller know when to charge., what type, make, and model do you recommend that would maintain these batteries. I e-mailed magnum as to what would the settings be for this type of battery. I am also holding off. I’ll be using a Magnum 4048 inverter. Curious to hear what Magnum says about compatibility with LFP batteries. It appears gud but do u have a branch in kenya where i can see the batteries? Sorry, we do not have location in Africa.